Like this? Get hold of a print here. Everyone knows that London is the Big Smoke, and Edinburgh Auld Reekie. 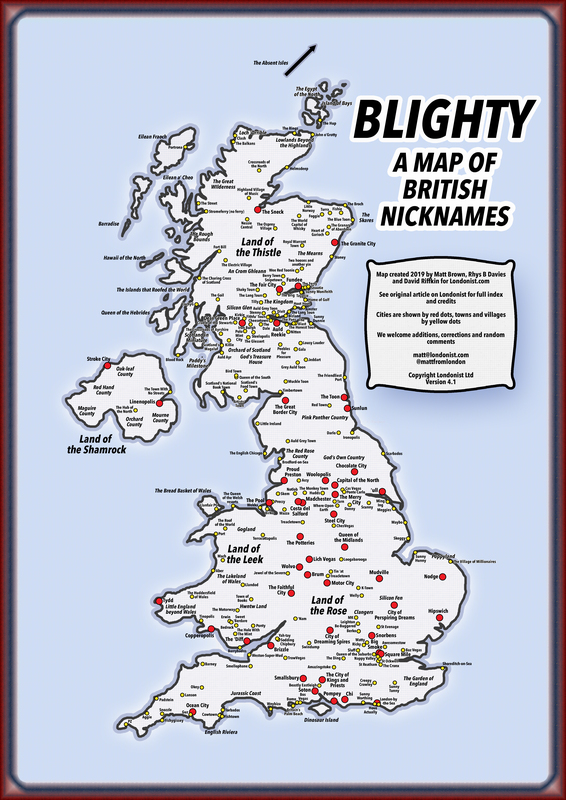 But what are the nicknames of Coventry, Glasgow and Norwich? Where can you find Copperopolis, Woolopolis, Linenopolis and Chocolate City? Do you know the difference between Polo Mint City and The Hole With A Mint? Most importantly: is your home town on the map? 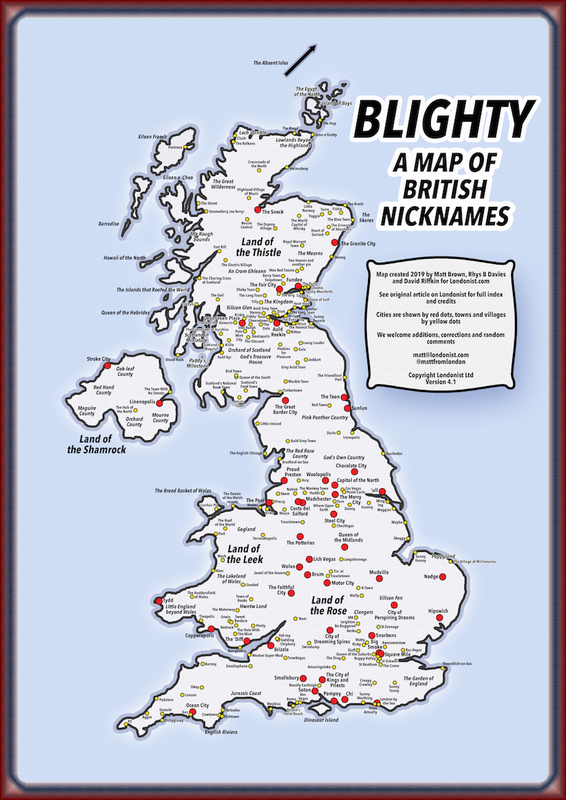 We've put together a map of nicknames for British cities (red), towns/villages (yellow), and regions. The map contains more than 260 places across the whole of the UK. We want to grow the map with many more suggestions from readers. If you know a nickname that's missing, or you have a better alternative for one of the existing names, then either leave a comment below or email matt@londonist.com. We'll add your name to an acknowledgements section below. Note: this is a map of places, not people. Nicknames such as Scousers, Geordies, Cockneys, etc. are not included... that may well become a future map. Is there an index to place names? Yes indeedy. Here's a Google Sheet, giving the real names of every place on the map, alongside some explanations. The first 120 places were plotted by Matt Brown with key help from Rhys B Davies. A special mention to Tyler McChantelle, who contributed many additions. This list was particularly helpful for Scottish nicknames. If you've got a suggestion that we use, we'll add it to a list of contributors here. Thanks to Peel Acres, Jules Alexander, Ruth Allcoat, Emily Ashford, Laura Blower-Harris, Richard Bratby, Richard Carroll, Jill Collier, 'The Dark Air Moves Through the Trees at Night', Paul Davies, Alex Dawson, Tim Dunn, Johnny Fox, Martin Francis, Elisabeth Galea, The GroundHopper, Tom Hamilton, Ian Harvey, Chris Hayes, John Hinde Collection, Jo Mo, Turmut Hoer, Eleanor M Jackson, Simon Johnson, Martin Ketteringham, Kirst, David Kirwin, Jim Lambe, David Lewis, Andy Mackenzie, Magoniareview, Joe Mawson, Tyler McChantelle, Mike Newman, Josh Nullis, Eleana Overett, 'Rebecca', Dave Sifleet, Carol Stanier, The Stolly, James Tanner, Maureen Taphouse, T Dev, Mike Turner, Andrew Weatherill. Like this? See also our map of Fake Britain, showing fictional places in England, Scotland and Wales.